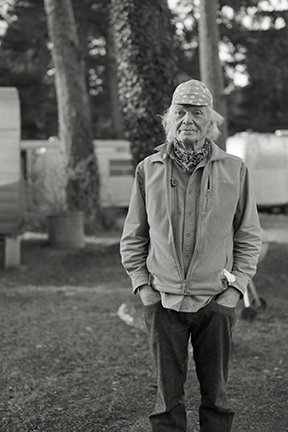 Michael Hurley grew up in Bucks County, Pennsylvania. As a teenager in the 1950s he fell in love hearing the music of Fats Domino, The Everly Brothers and Bo Diddley blast from the radio, and was enthralled by the records of Blind Willie McTell, Hank Williams and Uncle Dave Macon that he sought for his own. This love for music, true and unvarnished, supplied him with a finely tuned musical compass he has not wavered from for 50 years and counting. Hurley’s music sounds old, like it has always existed, and simultaneously singular, like something you’ve never heard anyone else play quite like that before. Pressed for a description, Hurley has called it “jazz-hyped blues and country and western music”. Hurley’s new album, on the Mississippi label, is due this year. Besides being a truly unique musician, Hurley is also a cartoonist and watercolor artist of note — the instantly recognizable results of which grace his album covers.